The USAF conducted an extensive competition for the replacement to the F-15 Eagle under the Advanced Tactical Fighter (ATF) program. Two finalists were selected from the early concept phase of the program. Lockheed-Martin for their YF-22 and Northrop for the YF-23. The program was intended to future-proof the next fighter against the equally innovative Soviet OKBs' fighter designs. The Air Force also wanted to step up the capabilities of this next aircraft by employing more advanced stealth technologies to counter advanced enemy air defenses, integrated avionics, and to employ a new aerodynamic feature called 'supercruise' - the ability to sustain Mach 1.6 flight without afterburner. To put the program into perspective, the Request For Proposals was issued in mid-1986 for this stealthy ATF fighter, whereas existence of the F-117 Stealth Fighter became public in 1988. The F-117 would be put on its first public display in 1990, the same year that the YF-22 and YF-23 flew for the first time. The YF-22 was selected for production in 1991 and after numerous delays to overcome technology hurdles, the first F-22A was rolled out in 1997. The aircraft has completed extensive flight testing and is in service with several squadrons around the country. While the original threat that this aircraft was designed to counter has gone away, world events have shown that an advanced fighter is needed to kick open an enemy's air defenses, both airborne and SAM. The F-117 was able to do the job of tackling the ground targets in several conflicts with great success, but the loss of one from a Serbian SAM in 1999 proves the need to transition the role of day one combat operations from the F-117 to the F-22 and soon to the F-35 as well. When Italeri first released this kit seven years ago, it was the first to be designed to represent the altered proportions of the production fighter. Since that time, oddly enough, nobody else has attempted to one-up Italeri with their own F-22 offering. 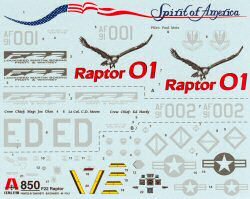 When I did receive a sample of this kit for review, I was so thrilled at the time that I neglected to do an in-box review of the kit - I ran VFR-direct to my workbench. 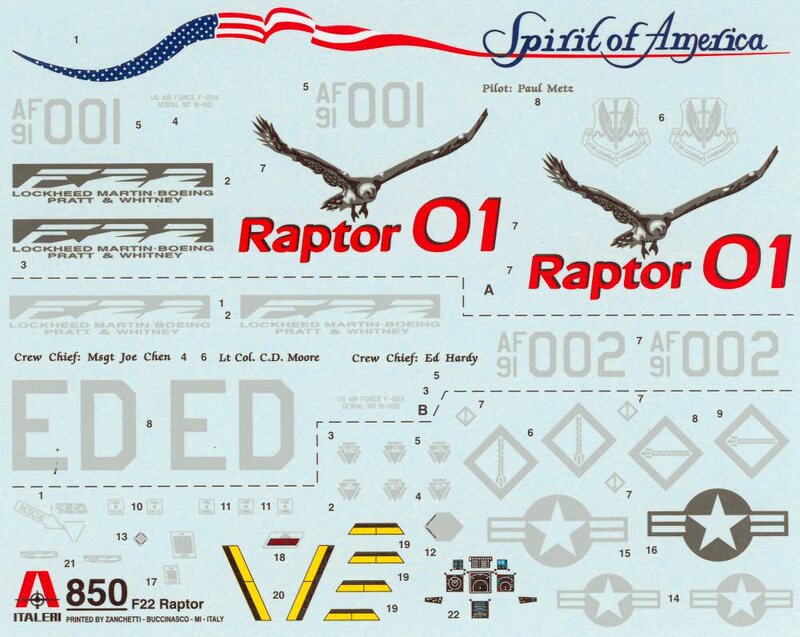 You can take a peek at my early build here, but note that wouldn't become apparent that paint schemes on the Raptor were going to be a little different than earlier USAF fighters. 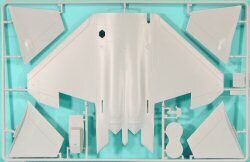 The kit is molded in light gray styrene and presented on four parts trees, plus a small tree containing the canopy and other clear parts. The details on the aircraft, especially in the weapons bays, is very nice. Now that we have better information available, we can no-doubt 'tweak' some of those details that were placeholders back when the kit was first designed. Remember that many of the details of the aircraft remain cloaked in secrecy (for good reason) so Italeri had to do the best they could with the information they had. I think they did pretty well! The forward fuselage is molded separately from the main, but I didn't run into any fit problems merging the front and rear sections. In fact, the only real fit problems were the intakes and missile bay doors. 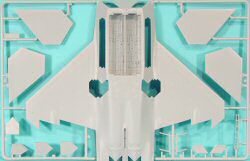 In the case of the intakes, it was a straightforward fill job, and the bay doors are not a problem if you're posing the aircraft with the doors open. 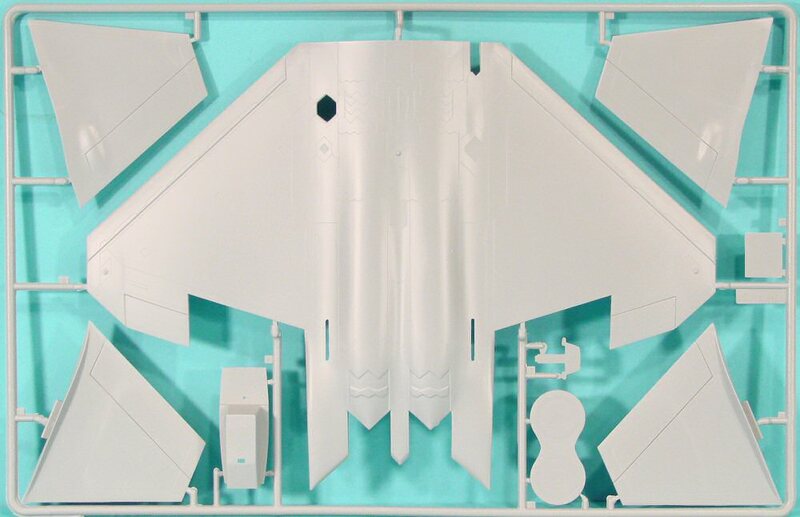 The kit does feature separately molded trailing edge flaps and horizontal stabilitors, while the ailerons, rudders, and leading edge flaps are molded in place. Looking at photos of the Raptor at rest, you can see some shots with everything locked up and neutral, while others show the trailing edge flaps, stabilators and even rudders drooping. Look at some photos and decide how you'd like to pose your aircraft. The kit cockpit isn't bad though it is a bit spartan. The four-piece ACES II ejection seat lacks seatbelts and harness details. 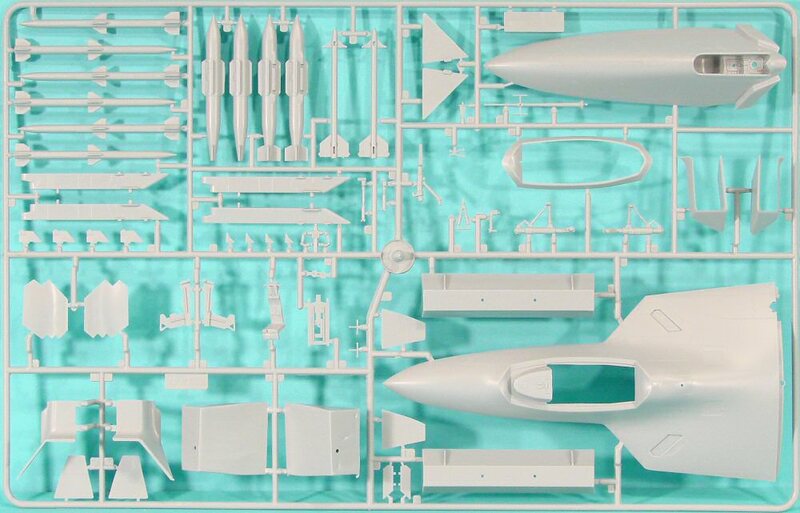 One solution is to pick up the Eduard detail set for this kit (reviewed here) and you'll dress up a number of areas on the airframe. 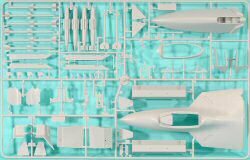 In the cockpit, basic modelers will be happy with decals for the instrument panels and side consoles, AMS modelers will want to update the 'pit' with an aftermarket set. This isn't a specific problem with this kit, Italeri tends to keep the cockpits in their kits simple. 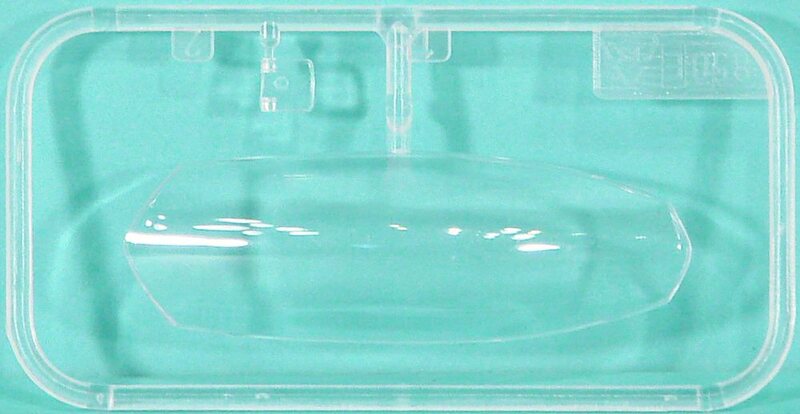 It isn't obvious from looking at the kit in the box that there is one minor glitch with the kit and that is that the tip of the nose sits on the aircraft centerline when viewed from above and from the side. It is supposed to be on the centerline when viewed from above, but the nose has a distinct droop below the centerline when viewed from the side. Fortunately, we have a solution for that in our conversion build article here. If you are going to pose the canopy open, take note of the details visible under that canopy frame. You'll have to do some scratchbuilding to achieve the same look. Check out the photo gallery on Cybermodeler (link at the end) for details. The kit includes AIM-9L/M Sidewinders, AIM-120 AMRAAMs, and what are supposed to be JDAM (Joint Direct Attack Munition) GPS-guided bombs. Let's just say that it might be better finding some aftermarket weapons for this aircraft should you decide to pose the weapons bay doors open. 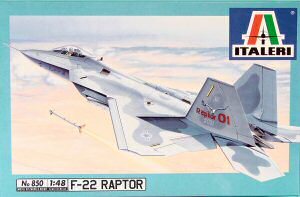 With more Raptors coming online, more information coming available, and more aftermarket options to work with, perhaps you ought to dust off the F-22 you've stashed away or perhaps pick one up from your hobby retailer.